Ed Gardner in Editor's Picks Science & Technology on 12 June, 2018. For years we’ve looked to the stars and dreamt of life on other worlds, but recent findings by NASA’s Curiosity rover on Mars show that we might be looking in the right direction. A selfie taken by NASA’s Curiosity Mars rover. In a paper published earlier this week, the discovery of organic molecules a few centimetres below the surface in the Gale Crater was reported. Organic molecules, compounds composed primarily of carbon, hydrogen, oxygen, and nitrogen, are associated with life. To our knowledge, these compounds are essential for life as we know it. The molecules were identified to be small organics such as thiophenes, benzene, toluene, and short carbon chains like propane or butene. This, therefore, presents exciting possibilities for life on the Red Planet. 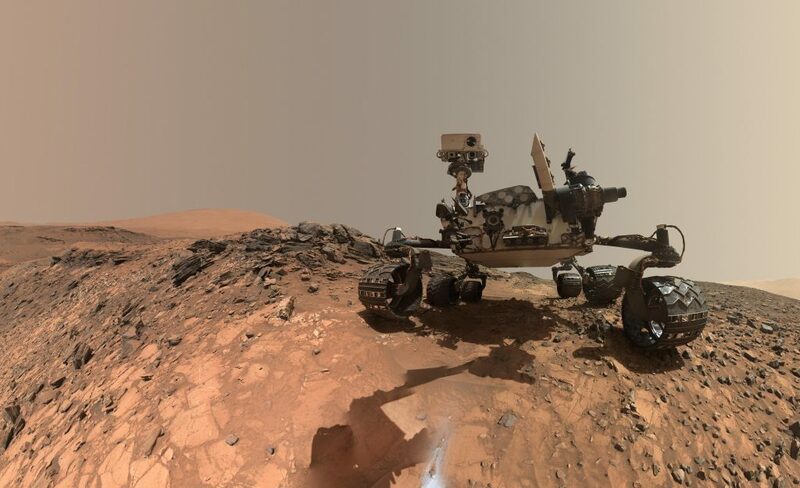 The organic compounds found by Curiosity were contained in three-billion-year-old sedimentary rocks found just below the surface, acquired by drilling in four areas in the ancient lake within the Gale Crater. Another vital component for life is the presence of liquid water at the planet’s surface, and, although Mars is currently inhospitable, it is widely thought that it once had a climate and atmosphere that allowed for liquid water. The data from Curiosity thus suggests that at some point, billions of years ago, the water lake within the Gale Crater held all the building blocks for life. However, the possibility of the existence of life is not necessarily evidence for it. It is possible that the compounds were formed by non-biological processes. “Curiosity has not determined the source of the organic molecules. Whether it holds a record of ancient life, was food for life, or has existed in the absence of life, organic matter in Martian materials holds chemical clues to planetary conditions and processes,” reveals Jen Eigenbrode, lead author of the paper. Additional discoveries made by the rover have also been recently revealed. Another paper published this week(3) describes the observation of seasonal variations of methane in the planet’s atmosphere. Methane is another small organic compound, that in Earth’s atmosphere is produced predominantly through biological processes. Over the past five years, equivalent to almost three Mars years, Curiosity has been measuring the variation of methane in the Martian atmosphere. Seasonal variations in the atmospheric methane levels were shown to occur, with levels rising in the warmer summertime and falling during the cold winter periods. Atmospheric methane on Mars could be a potential biosignature for bacteria on the planet, and the observed variations may support this hypothesis. Whilst other chemical processes may be generating the methane, scientists cannot rule out the possibility of biological origins. Fundamentally, the amplitude of the seasonal cycle indicates that there remain unknown atmospheric or surface processes occurring in present-day Mars.